The Chamber is a member-based organization, and area businesses and organizations are invited to learn about joining our efforts. THANK YOU to our SUSTAINING MEMBERS for your Contributions and Support of the Chamber! When members take advantage of the numerous value-added benefits that Chamber membership provides, their membership is often paid for many times over. Join the Chamber today to start reaping the benefits. Do You Love Our Community Like We Do? 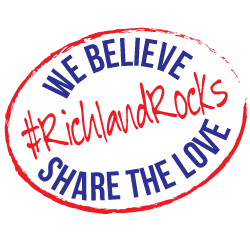 Be a part of the #RichlandRocks movement and be a RockStar!